It may seem a bit unfair, but I don't think that it would be completely off the mark to say that most every horror movie has a gimmick. From Michael Myers' mask to Jason Voorhees' mask to the Tall Man's sphere, there is usually something from a horror movie which not only stands out and defines the movie, but becomes something on which part of the story was built. The movie could most likely exist without the gimmick, but it would certainly be missing something. Now, what if the entire movie was the gimmick? That would be something else entirely and it would be an example of a movie which is truly placing all of its eggs in one basket. That is the case with From the Dark, a movie which redefines minimalist. As From the Dark opens, we see a dirt farmer (Gerry O'Brien) (I call him a "dirt farmer" because I have no idea what he was doing besides building piles of dirt) unearth some strange objects. He is then attacked by a dark figure. We then meet Mark (Stephen Cromwell) and Sarah (Niahm Algar) who is driving through the Irish countryside on a romantic holiday. Things get bad when they get somewhat lost. Things get worse when their car gets stuck in the mud. Mark goes to find help and when he approaches the one house in the area, he meets the wounded farmer. Mark returns to the car to fetch Sarah and when they get back to the house, the farmer attacks them. They then realize that something far more dangerous is present and that it stays in the shadows. Mark and Sarah must now find any source of light possible in order to survive until morning. If some of From the Dark sounds somewhat familiar, it's because it presents us with a monster similar to those found in Darkness Falls and They. This is a creature which shuns the light and can only attack in darkness. Therefore, Sarah and Mark must utilize any kind of light that they can find. (It doesn't matter what, as long as it has some sort of glow which breaks up the darkness.) What separates From the Dark from those other films is that they had detailed backstories which explained what the monsters were and gave clues to their motivations. That is not the case with From the Dark. All that we know is that the farmer's digging released some sort of creature and that it's dangerous. We are never told what the monster is and what its origins are. We gather that its powers are similar to that of a vampire and that's about it. Again, this film is simplicity at its finest. We get some dialogue between Mark and Sarah when they are first introduced, and that's about it. Following their discovery of the house, the dialogue consists mainly of things like "Help!" and "Run!". Clearly, Writer/Director Conor McMahon is hanging a lot on the film's simple premise and I can't help but imagine that he sat down and made a list of things that emit light while completing the script. There is no safety net for him here -- the bulk of the movie is about people attempting to stay in the light in order to stay alive. No subplots, no other characters, no nothing. Admittedly, the premise does run out of gas near the end, but McMahon shows a great deal of talent by being able to wring a nice amount of suspense out of film. We realize that Mark and Sarah aren't necessarily safe and given that this isn't a Hollywood movie with well-known actors, there's no way of predicting who may live or die. There are some very nice shots here, most notably one in which Sarah lights a cigarette which standing behind the car, and McMahon does a nice job of having things constantly moving in the dark background. I'm sure that some will find From the Dark simple approach unappealing, but it's much better that many "overwritten" movies that I've seen. The lean and mean style of the film wastes no time in having the monster appear and the violence ensue. There is a nice amount of suspense and some good old fashioned "why don't they?" moments where you'll find yourself talking to the screen. Cromwell and Algar were clearly game, as we watch them bang around in the dark and really going for it. Kudos to McMahon whose last film was the misguided Stitches. His ability to make something out of nearly nothing in From the Dark shows that he has talent and I'll be sure to check out his next project. 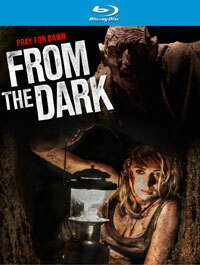 From the Dark convinced me to have a flashlight on-hand at all times on Blu-ray Disc courtesy of Dark Sky Films. The film has been letterboxed at 1.78:1 and the Disc contains an AVC 1080p HD transfer which runs at an average of 32 Mbps. The image is sharp and clear, showing no distracting grain and no defects from the source materials. As one would expect, this is a very dark movie, but the image is never overly dark and the action is always visible. The transfer actually does a nice job of handling the darkness and the black levels are very good. The image has a nice amount of depth and the level of detail is notable. The Disc carries a DTS-HD Master Audio 5.1 track which runs at 48 kHz and an average of 2.5 Mbps. The track provides clear dialogue and sound effects. The track does a great job with stereo and surround effects, as we are treated to various effects coming from around the house. This helps to heighten the films effects, as we are given an idea of where the monster is. The subwoofer effects are strong, but never overwhelming. The From the Dark Blu-ray Disc contains only a few extras. We begin with an AUDIO COMMENTARY from Writer/Director/Producer Conor McMahon. "Behind the Scenes" (21 minutes) is a long reel of "fly on the wall" video from the set where we get to see the actors and crew at work. Occasionally, someone will address the camera, but otherwise this is simply letting us see how certain scenes were shot. The only other extra is a TRAILER for the film.